Thanks to programmes such as the BBC’s Blue Planet II we’re acutely aware the impact the world’s reliance on single-use plastics is having on our planet and its occupants. The effects on marine life, so vividly demonstrated in the programme, are particularly devastating. Public awareness is now at an all-time high and if we don’t do anything about the issue, in 2025 the ratio of fish to plastic in our oceans will be three-to-one – one kilogram of plastic for every three kilograms of fish. Sadly 2025 isn’t too far away, so we need big ambition. If we as an industry act now, through our collective reach we can educate customers, influence the supply chain and effect change to this systemic and complex issue. That’s why, as chair of the mia, I felt compelled to launch a campaign as part of the association’s continued strategy to promote sustainable and environmentally-friendly operations, to encourage the business meetings and events industry to collectively take small steps to make a big difference. 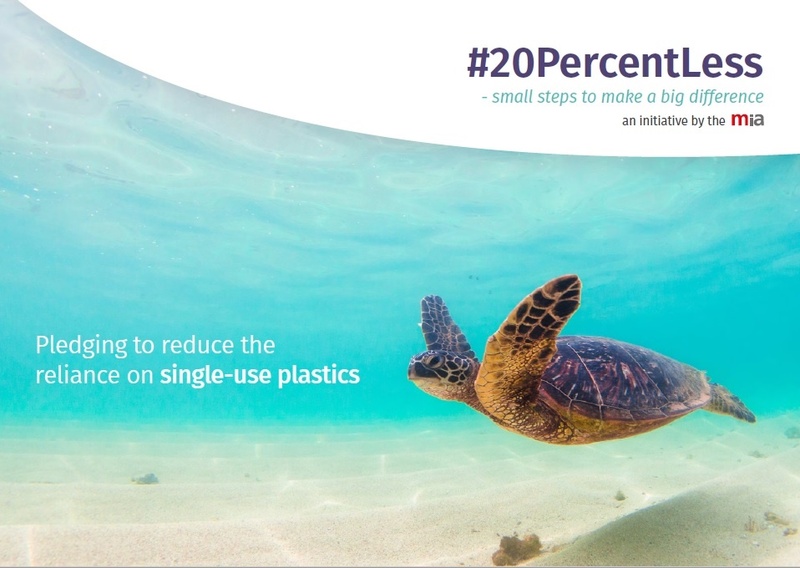 Aiming to reach venues, hotels, caterers and suppliers in the business meetings and events industry across the UK, #20PercentLess is asking the industry to eliminate single-use plastics from their organisation by 2025. While we hope it initiates change, the purpose is to pull together some of the leading sustainability minds, highlight trends and share best practice so, collaboratively as a sector we can start thinking about and implementing solutions. This isn’t something that’s going to happen overnight, but the mia is determined to educate and share, and will be supporting this campaign and others over the next five years and beyond. I'd like to thank everyone who has already taken the time to pledge their support to the initiative. The commitment and enthusiasm displayed by those involved as well as the results from our industry survey, have helped further fuel the mia’s support to effect positive change.